The AWS Digital User Engagement team hit the ground running this year. From speaking in front of crowds of digital marketers and developers, to developing new tutorials to help make it easier to get started building solutions to common use cases, here’s the latest on what we’ve been up to and our latest updates to Amazon Pinpoint. Simon Poile, GM of AWS Digital User Engagement, had the pleasure of speaking to hundreds of digital marketers at the Digital Summit conference in Seattle, WA on February 26th. Digital Summit attendees are the movers and shakers influencing the growth and success of their company’s digital marketing — and the future landscape of the digital economy. Simon provided insights on how marketers can embody the Amazon culture of customer obsession to gain a deeper understanding of their customers, strengthen trust between brands and their users, and create a personalized digital engagement experience that is timely, contextually relevant, and reaches the right user at the right time through the right medium. He discussed how marketers can embrace technology such as machine learning and IoT to accomplish transformative engagement, and provided insights about how brands around the world are using AWS Digital User Engagement solutions to transform their engagement efforts. In a recent article posted on A Cloud Guru, Dennis Hill explains what two-way SMS is and how you can quickly and easily start sending personalized, timely, and relevant text messages to your customers with Amazon Pinpoint. He then shows how you can implement a practical solution for setting up an SMS long codeso you can start sending and receiving text messages. On Wednesday the 27th, we launched the first Amazon Pinpoint Getting Started Guide. This guide, located in the Tutorials section of the Pinpoint Developer Guide, shows you the entire process of creating a customer registration solution for SMS messaging. A common way to capture customers’ mobile phone numbers is to use a web-based form. After you verify the customer’s and confirm the customer’s subscription, you can start sending promotional, transactional, and informational SMS messages to that customer. In the tutorial, you’ll learn how to set up two-way SMS messaging in Pinpoint, create a web form to capture customers’ contact information, send registration information from your own website to a Lambda function using API Gateway, how to implement a double opt-in strategy, and more. The tutorial is intended for users of all skill levels. While there is some coding involved, all of the necessary code is included. You can use this tutorial to create a complete solution, or as a starting point for your own use case. Amazon Pinpoint is now available in the US West (Oregon), EU (Frankfurt), and EU (Ireland) regions in addition to the US East (Virginia) region. You can now use Amazon Pinpoint to power your digital user engagement without having to transfer your customer data across regions. This regional expansion is particularly useful for organizations in certain regions of the EU, where data residency considerations previously made it difficult for many customers to use Amazon Pinpoint. It also creates a global infrastructure that helps to improve availability and redundancy while reducing latency. Deliver voice messages to your users with Amazon Pinpoint Voice. Set up campaigns that auto-send messages to your customers when they take specific actions. Detect and understand issues impacting your email deliverability with the Amazon Pinpoint Deliverability Dashboard. 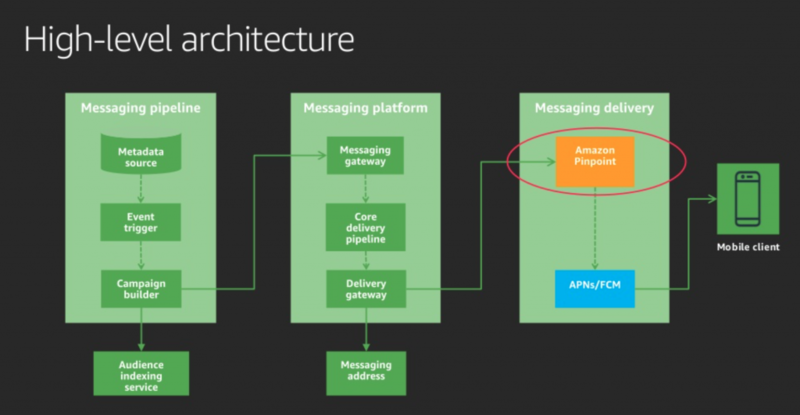 How Hulu uses Amazon Pinpoint for their real-time notification platform. At Hulu, notifying their viewers when their favorite teams are playing helps them drive growth and improve viewer engagement. However, building this feature was a complex process. Managing their live TV metadata, while generating audiences in real time in high-scalability scenarios, posed unique challenges for the engineering team. In this video, Hulu discuss the challenges in building their real-time notification platform, how Amazon Pinpoint helped them with their goals, and how they architected their solution for global scale and deliverability. Watch to learn how they built their solution. The AWS Digital User Engagement team will be at the AWS Booth #2617 at Shoptalk, March 3-6 at the Venetian in Las Vegas. Stop by to view our demo of the integration of Amazon Pinpoint and Amazon Personalize, which will show how a customer’s interaction with products in a retail setting can be tracked with smart-devices connected to AWS, resulting in real-time inferences and predictions on a customer’s affinity for products they haven’t yet interacted with. This information can be used to send push notifications with Amazon Pinpoint to a customer’s mobile device, making them aware of the products and possible deals that Amazon Personalize has predicted they will appreciate.